Michael's tour includes a myriad and explanation of many examples of America's finest architecture, featuring such styles as Georgian, Classic Revival, Palladian, Adamesque, Italianate, Regency, Greek Revival, Second Empire, Eastlake, and Queen Anne. Charleston's historic buildings are known for elaborate architectural components whose names have stories all their own, such as crenelations, quoins, vermiculation, rustication, voussoirs, and triglyphs. Wrought iron is a Charleston tradition, dating to the 18th century when ironsmiths fashioned Swedish bar iron into exquisite shapes by hand. The iron was heated on open flame to soften, then and pounded with hammers or twisted to create delicate rosettes and stylish scrolls. Roof lines are dramatic in Charleston, and feature hipped, gabled, Gambrel, Mansard and jerkin head roofs. 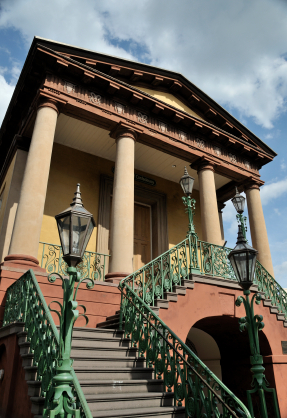 The doorways of Charleston are among its most detailed construction, and along the tour you will see magnificent examples of fanlights, fluted pilasters, and dentil molding. Charleston brick masons were famed for their jack arches, belt courses and corbelling, which is still evident today in many older buildings. Stucco is a combination of lime and sand that was used extensively over brick exteriors by 'raking' brick surfaces to create a base, then scored to resemble blocks of stone.